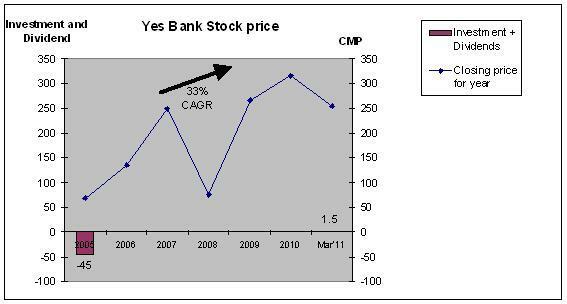 Yes Bank is an aggressive high potential new generation bank. The recent fall in prices by 28% makes this an attractive entry point for long term investment. There is an updated report of Yes Bank available at link The Brave Warrior of Indian Banks by JainMatrix Investments includes Q1FY13 results, news updates and FY15 projections. Founded by bankers Rana Kapoor and Ashok Kapur, (combined stake 32.6%). Other shareholders are Rabobank 18.20%, AIF Capital (private equity), Orient Global (investment firm), Swiss Re, Khazanah Nasional (Malaysia Govt) all 3.5-5% each. It has 185 Branches currently of which 14 were added in Q3 FY11. Focus on Knowledge based approach to lending. Loans exposure is to sectors like Food and Agribusiness, Engineering, Infrastructure & Logistics, TMT (Technology, Media & Telecom) and Healthcare. There are four business verticals in the bank: a) Corporate & Institutional Banking b) Commercial Banking c) Business Banking-SME d) Retail Banking. The business focus was Corporate banking till now and on select sectors while providing the entire value chain in those niche sectors. Having achieved some scale, the bank is now widening focus into SMEs and Retail. Mistakes are made, but it learns from these, and exits fast (example – in 2007, there were a lot of complaints against complex foreign exchange derivative products sold to SMEs, that turned loss making. There were litigations against Yes Bank (and several other banks too). All these have been resolved. It’s IPO in July 2005 was priced at Rs 45. It was 31 times oversubscribed. The maiden dividend was paid in 2010. 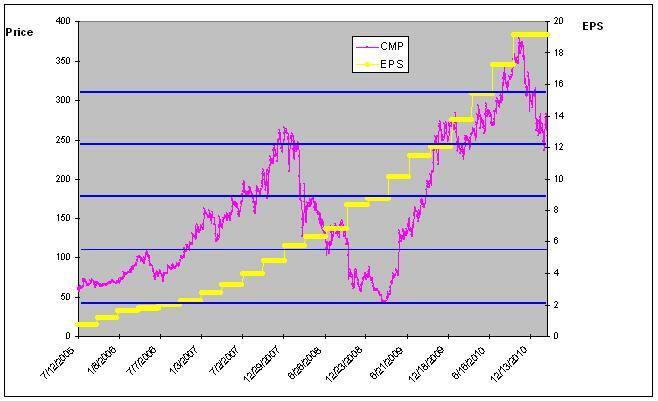 After IPO, made at a high valuation, the PE stayed high for a few years (fig 3). 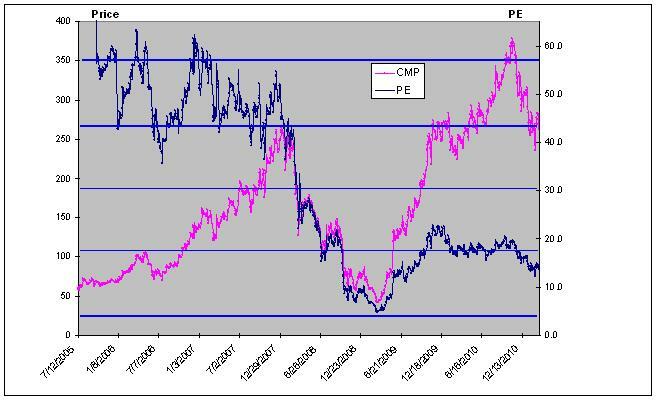 The patient investor got rewarded in 2008-2011 period, where the share price rose rapidly. EPS (adjusted for equity dilutions) growth has been 36% CAGR over the last 5 years. The EPS quarterly graph (fig 4) shows an amazing parabolic rise. I would say it is a great company just achieving critical mass of size, brand and reach. RoE is at around 20% – healthy statistic. Price/Book is 3.08, this is fair for a mid sized fast growing bank. CASA ratio stands at mere 10.1% as on Q3FY11. This is low by general banking ratios, but this is being addressed aggressively. India is an underbanked country. The RBI is actively encouraging new banks, and vast swathes of Rural India remain unbanked. The potential for Yes Bank to grow is large. At the same time, competition in urban areas is high, due to presence of public sector, private as well as MNC banks. RBI expects average industry growth rate to be 20% during FY11. 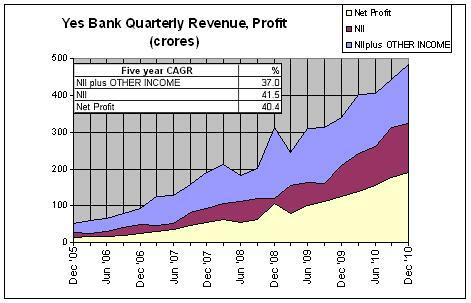 Yes Bank is expected to grow at a far faster rate than industry. It has well-defined, sustainable growth strategies in place. However a look at the graph of DMA of the stock (fig 5) shows that the stock stays for long periods of time above or below the 200 DMA. 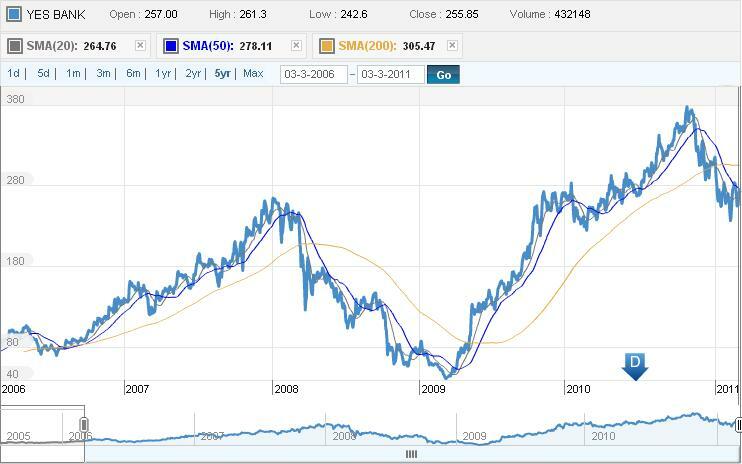 It recently went below the 200DMA, so my advice is to wait for the stock to go above this before investing. However retail investors can start to Invest systematically. Excellent Report. Keep it up. Can You advise on Marg Limited a South India based infra and ports company.